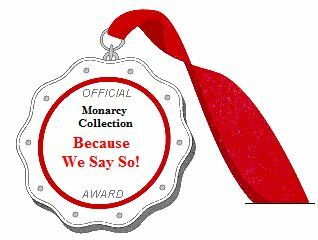 The Monarchy Collection, or more properly the Moron Collection, is another of the many "We Say So" companies inducted into the Tabberone Trademark & Copyright Abusers' Hall Of Shame. You cannot sell their merchandise on eBay because they say so. The fact the law says that you can sell their merchandise is of no consequence to these left-coast whackos because they are special. And we are betting people call them special quite often. The Monarchy Collection is another proud winner of the Tabberone We Say So Award given to those arrogant morons who believe the world revolves around them and that gives them the right to ignore the rights of others. The jerks at Monarchy followed that illiterate missive with the pompous and overbearing snide comment, "Did you read our published VERO Statement". They then included the entire VeRO Statement they had on the eBay web site at http://cgi3.ebay.com/ws/eBayISAPI.dll?ViewUserPage&userid=monarchy_collection, which we have reconstructed the Monarchy Collection AboutMe here and added emphasis to highlight the portions that are lies or misrepresentations of law (we think they are deliberate misrepresentations which also makes them lies).And there are many lies and misrepresentations. Their lawyer, must be a bigger moron than they are, if these Bozos actually employed a lawyer to write that holier-than-thou mis-description of their rights. They only thing they didn't threaten was to send No-Neck Louie to you house to breaka you legs. Monarchy Collection and its licensees have the exclusive right to use its copyrighted works and trademarks. Except for that pesky little thing called "fair use" that says otherwise for both copyrights and trademarks. And "copyrighted" works implies the work was actually registered.. However, a check of U.S. Copyright Office records show absolutely NO COPYRIGHTS registered under the name Monarchy Collection or in the name of Eric Kim, the brain-dead owner of this collection of misfits. The Monarchy Collection may actually have some registered copyrights but we really doubt it. Few companies bother to register their web sites mainly because web sites are not considered periodicals and they would have to be re-registered every time there is a change. Tedious and gets expensive. Companies rarely copyright their product tags (not to be confused with labels) and product labels mostly because items of this nature are routinely refused by the copyright office, not to mention the cost. Most brochures are not registered for the same reasons. So, if Monarchy Collection wanted to sue someone over the use of "copyrighted works", Monarchy Collection would first have to obtain a registration and the file a law suit, assuming the registration was accepted. Then, if successful in federal court, Monarchy Collection could only collect actual damages and actual profits, but not statutory damages or legal fees. So why sue? It would be financial suicide because of the enormous legal fees. But, as we have noted, this herd of nincompoops has the collective IQ of a small village. Anyone who uses Monarchy Collection marks, without Monarchy Collection's permission, is liable for trademark infringement. ...textual and photographic works produced and published Monarchy Collection or its licensees are protected under U.S. and international copyright laws. Eric Kim The Monarchy Collection is another company who thinks because people actually buy their over-priced schlock that they are special. The have no respect for the rights of others. If they did, they would not be engaged in telling these lies. In addition, through the concentrated efforts of the Authentic Forum, the Monarchy Collection began reinstating listings that they had ordered terminated. But that sort of effort should not have been needed. But, to what avail? The Monarchy Collection ordered the relisted item terminated for trademark infringement. Eric Kim and the staff at the Monarchy Collection are scum of the lowest order. And where did Kim get that haircut? Did some large person sit on his head?